Deutsches Zentrum für Luft- und RaumfahrtRosetta with Philae lander, before separation. Frame from the movie ‘Chasing A Comet — The Rosetta Mission’. The moment we’ve all been waiting for is one day away. On Wednesday November 12, the European Space Agency’s Rosetta spacecraft is scheduled to deploy the Philae lander in the first attempt in human history to land a probe on a comet — a feat not easily overcome. 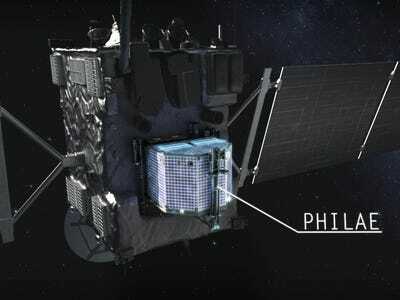 It will take a total of 7 hours to complete the series of events that will get Philae on the comet. A culmination of the ten years that Rosetta spacecraft has spent in space before finally catching up with Comet 67P/Churyumov — Gerasimenko. And you can watch the events unfold in the European Space Operations Center Mission Control Room live. And now that Rosetta is in orbit, it has one last mission: deploy Philae. The entire process will take 7 hours from release to landing and securing Philae to the comet. Then, the lander will have about 2.5 days of battery life to do some science. Landing on the comet will take a series of complicated orbital movements, shown below. ESAOrbital movement of the Rosetta Spacecraft. A comet is one of the most unfriendly objects we could ever hope with which to make contact in the solar system. Jagged peaks and troughs make the surface dangerously uneven for a lander, and this comet — Comet 67P/Churyumov — Gerasimenko — is rotating about its axis every 12 hours, meaning the landing point is always on the move. DLRdeAnimation of Comet 67P/Churyumov — Gerasimenko. 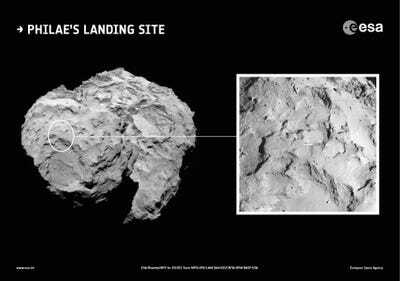 Philae, on the other hand, will return the first images from the actual surface of a comet. The lander will also use its ten instruments to conduct the first analysis of a comet’s composition while on the surface. The most exciting prospect of this ten-year endeavour are the revolutionary discoveries that await us upon touch down. Stay tuned!